There's a very popular idiomatic expression among Filipinos that goes "Kapag pumuti na ang uwak (When crows turn white)." It's an expression to assert the impossibility of something ever occuring. It's very similar to the English idiom, "When pigs fly. "Well, this Filipino idiom runs the risk of losing its relevance after the establishment of the fact that white albino crows do exist. A man from the southern province of Lanao del Norte in the Philippines has in fact filmed one. Freddie C. Puerto captured a thirty-second footage of a rare white albino crow in barangay Maranding in 2012. However, it was only last year (2013) that he uploaded the video on his Facebook page. The clip has since captured a lot of attention. As of this writing, the video has generated over 20,000 shares. White crows are indeed very rare but they've been recorded and documented almost in every country where they are part of the local bird population. Their white colors are due to a congenital disorder called albinism. This is caused by problems with pigment production. The disorder has also been documented in other birds like the kookaburra. White albino crows are also often distinct from each other. A full albino bird would have pink beaks, pink feet, and either pink or red eyes. In other instances, the bird may have white feathers but may still retain the black coloring on its beak, eyes and face. 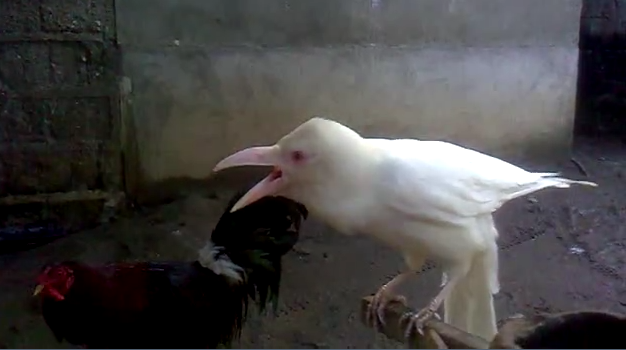 So the next time somebody uses the idiom, "Kapag pumuti na ang uwak" on you, you should show him or her this video of an albino crow.